A man who has been a coastguard for 33 years has been appointed an OBE in the Queen's Birthday Honours list. 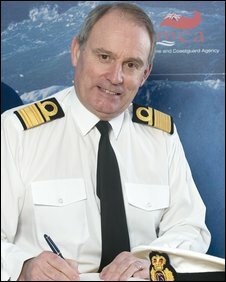 Peter Dymond, 62, from New Milton in Hampshire, is a former chief coastguard at the Maritime and Coastguard Agency. Hampshire Constabulary's Chief Constable Alex Marshall has been given the Queen's Police Medal. Others honoured in the list included Lord-Lieutenant of Hampshire, Mary Fagan, who was appointed Dame Commander of the Royal Victorian Order. Another coastguard James Roberts, from the Isle of Wight, was appointed an MBE, while the quad wheelchair tennis champion Peter Norfolk was made an OBE. Mr Dymond, who is now project manager for the volunteer coastguard rescue service, joined the Coastguard in 1976. During his service he was responsible for the early modernisation of the coastguard service, its training and its search and rescue operations. He said: "I am thrilled. Being a coastguard is very rewarding because we are involved in saving lives. "We are here to protect the public and the environment." Meanwhile, Mrs Fagan said: "I am thrilled and surprised that Her Majesty The Queen has honoured me in this way for doing a job that I enjoy so much. "It is a great privilege to represent The Queen in Hampshire and I look upon it as an honour for me and for the county of Hampshire."